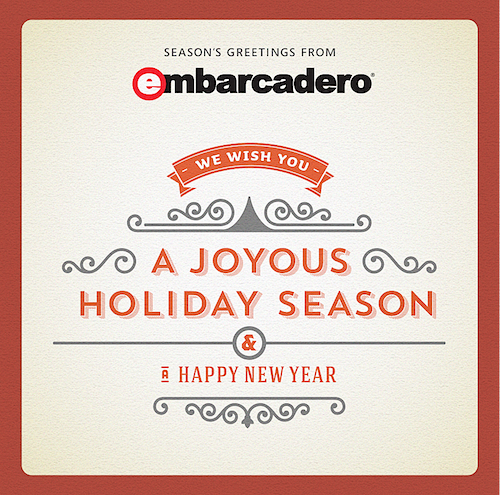 We Wish You a Joyous Holiday Season and a Happy New Year. Embarcadero is committed to providing the industry's broadest and deepest set of software tools for developers, DBAs, and architects. Widely recognized for its award-winning products, Embarcadero enables customers to work more efficiently with the industry's major database platforms, operating systems, frameworks, and programming languages. Embarcadero's heterogeneous tools enable customers to design, build, and run their databases and applications in the environments they choose, free from the constraints, costs, and learning curves associated with multiple platform-specific tools.